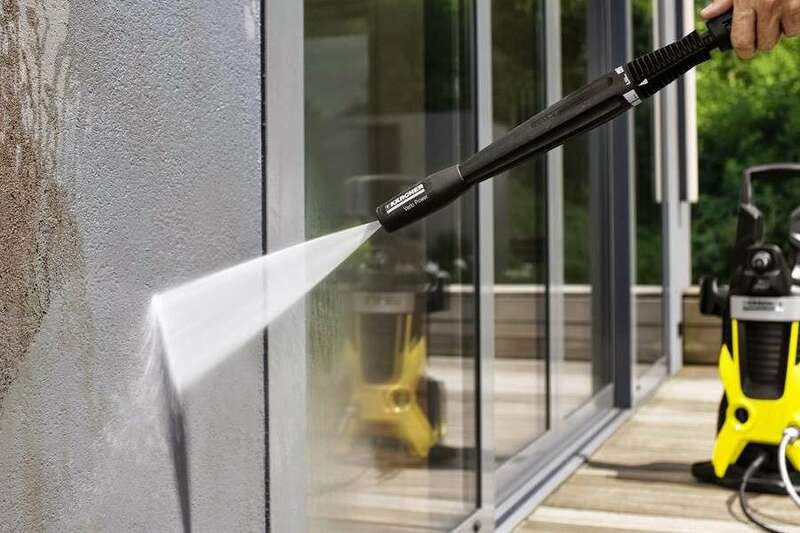 There are a number of factors you need to keep in mind when investing in a pressure washer. These heavy-duty cleaning machines make it easier for homeowners to improve curb appeal without investing a lot of money. 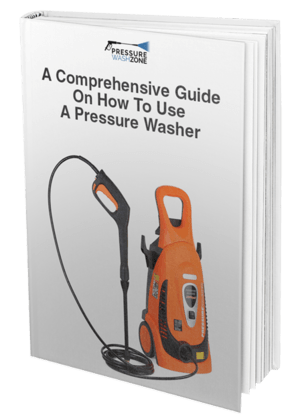 While there are a number of cleaning equipment out there to choose from, none of the machines work as effectively as an electric pressure power washer. Electric Pressure Washers are best suited for cleaning small items, such as pool areas, bikes, vehicle and backyard grills. These machines are more lightweight and portable compared to their gas counterparts. The Karcher K5 Premium pressure water machine is designed for sheer cleaning performance and efficiency. The machine is designed to generate an astounding pressure of water, measured at 2,000 PSI. This is the ultimate Karcher waster pressure model that is made to clean virtually anything from practically any surface. Water Cooled Induction Motor - The Karcher K5 features a unique water-cooled induction technology that circulates cool water around the motor. This lowers the overall temperature of the machine, prolonging motor life. This unique technology also allows the machine to work more quietly compared to other electric pressure washers in the market. Certified by CSA International, the product is ideal for the customer’s growing residential use. Onboard Detergent Tank - The Karcher K5 features an onboard detergent tank that results in easier detergent application. This makes it easier for consumers to control the amount of detergent to be used. The adjustable detergent flow dial further makes it easier for consumers to control the amount of detergent that is to be applied. Pressurized Hose Reel - The Karcher K5 features a 25-foot high-pressure hose. The built-in hose makes winding and unwinding much easier. Additionally, the product’s high quality stability foot results in stable unit that allows consumers to conveniently use the machine. 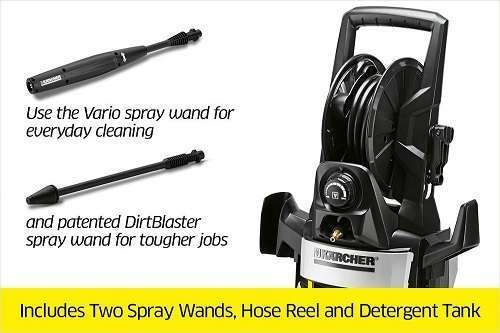 Includes Two Wands - The Karcher K5 features high-end and efficient accessories that make cleaning less tedious. Rest assured, to help you remove even the toughest of stains, the product features two wands, including the DirtBlaster and the Vario Power Spray Wand. The DirtBlaster makes it possible for consumers to remove the toughest stains, whereas the Vario Power Spray comes into play for less intensive cleaning tasks when you wish to adjust the temperature. Not to mention that the detergent automatically dispenses when you are using the wand on a low-pressure setting. Built to Last - TheK5 Premium is built and engineered whilst keeping rigorous demands of residential use in mind. It also features a highly durable handle along with 7.7” high impact wheels that make it easier for consumers to transport the machine to different spots without any inconvenience. 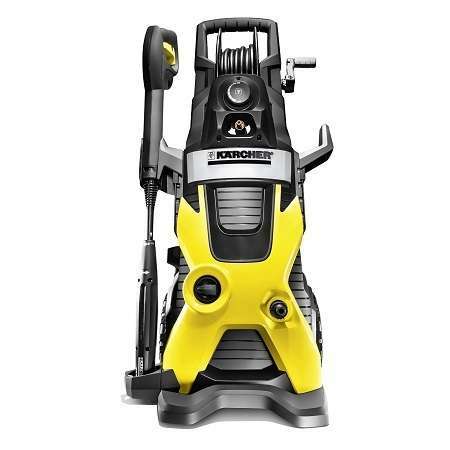 The Karcher K5 received an average rating of 4.1 stars out of 5 on Amazon. This indicates a majority of customers was happy with the product and left positive reviews. However, a number of customers agreed the product could use some improvements. A number of customers were impressed by how powerful the machine is and that it features a large pump. A customer wrote how they were able to assemble the machine in just about 20 minutes. Additionally, consumers were pleased that the product runs quietly and does not waste too much water. The electric pressure washer is quite durable and lightweight. This makes it possible consumers to transport the lightweight machine around. 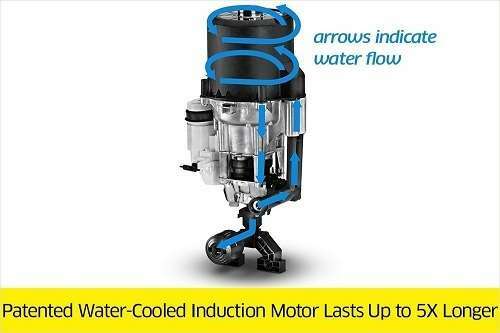 The water cooled induction motor runs on demand which means users can switch off the power according to their usage. However, on the downside, durability is a major concern. A customer wrote that the machine broke only a few months after it was purchased. While the main unit itself is quite sturdy, the accessories including the pencil spray and the Vario spray wand are likely to break after a few days of use. You will also find multiple videos of the product on YouTube that will teach you how to use the product more efficiently. The Karcher K5 Premium Electric Pressure Power Washer can be purchased on Amazon for a reduced price of under $235 (15% off). The price may vary depending on the seller. Invest in a product from a reputable seller so you can benefit from a warranty. To save a few bucks, consider looking out for promotional offers and discounts. Apart from Amazon, you can also purchase the product from eBay, Homedepot and Wal-Mart. Browse these websites so you can purchase the product at the best price. The Karcher K5 Premium Electric Pressure Power Washer can be purchased at Karcher’s official website for just under $330, which is quite pricy. The brand is currently not offering any promotional discounts and offers on their website. However, the website has plenty of educational content and guides that help you set up the machine on your own. You will also find a range of useful accessories on the brand’s official website. You may have to invest in more accessories depending on your usage, for example, a plain and rotating brush come in handy in case you want to wash your car. Overall, the Karcher K5 Premium Electric Pressure Power Washer is a powerful machine that might be suitable for all types of users. Avoid investing in this model if you only intend on using the machine a few times a year. If you are on a limited budget, consider investing in a different brand. To prevent the machine from wearing out, read the instruction manual carefully.